This Valentine’s Day, many of you may take a moment to celebrate your relationships and reflect on the good times you have had together. For many of the airmen and women at Kenley during World War II, romance blossomed on the airfield. Here are just two stories of couples from RAF Kenley. By late September 1940, Bill Barr and WAAF Lillias Robertson, had become very good friends. Bill was Platoon Commander with the Middlesex Regiment and Lillias was a WAAF (member of the Women’s Auxiliary Air Force). Lillias and Bill had often seen each other across the entrance hall of the Officers Mess at Kenley, but Lillias was so shy that it took a long while before she would even smile at him. A few weeks before the Hardest Day, Bill had organised a search party, to help Lillias find her bicycle, which had been lost during a raid; once returned to Lillias, Bertha the bicycle, became a part of the Barr family. As time moved on, Bill would, of an evening, walk Lillias across the dark aerodrome, back to where the girls were billeted. Lillias was sure to keep Bertha firmly between them, as she believed that it would not be proper for Bill to take her arm. Bill and Lillias would stop at the five-bar gate at the entrance to her accommodation and chat, arms resting on the gate as they looked out across London watching the raids that took place. In October, Bill’s regiment was redeployed elsewhere, and Lillias was sent to Gerrards Cross, for a training course; Lillias thought that she would not see him again. On Lillias’s return to Kenley, she heard from Bill, who was now stationed in North London. They decided that, to continue seeing each other, it would be best for them to meet in the middle; central London. They would visit the Sunday Club at the Dorchester Hotel, Park Lane, for dinner and dancing and as the night grew dark would make their way back to their respective RAF bases. That October, they got engaged, but Bill’s regiment were soon to be posted overseas so he wanted to marry Lillias straight away. 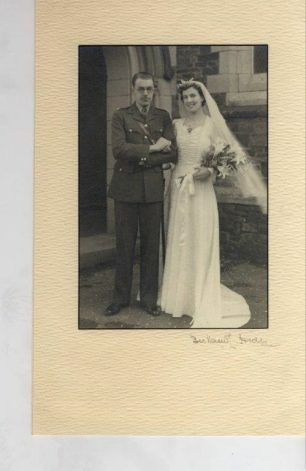 Lillias’s mother arranged the wedding in their home town in Devon and Lillias went to Bourne and Hollingsworth on Oxford Street to buy her dress. Lillias and Bill went on to have two children, and the Kenley Revival Project has been lucky enough to meet their children, grandchildren and even great-grandchildren. For more about Lillias Barr, take a look at the audio recordings on our Oral History page. Unfortunately, not all of these love stories, have a happily ever after…. S/L James Fielden Lambert was born 8th April 1917 in Manitoba, Canada. 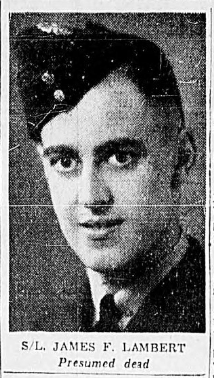 He enlisted in August 1939 and a year later was called up and completed his training at Camp Borden, graduating as a Sergeant Pilot in April 1941. The following month he was posted overseas, to Britain, and joined 130 squadron at RAF Warmwell in July. From April until September 1942, “Jim” served in Malta with 185 squadron, where he was shot down and wounded. During his time on the Island, Lambert was “a good fighter pilot,” according to Air Vice-Marshal Keith Park, A.O.C. R.A.F. Mediterranean. He was posted back to Britain as an instructor, before returning to operational flying with 416 squadron on 23rd June 1943, then 403 squadron on 16th October (as Flight Lieutenant) and finally to 421 squadron on 13th December, as Acting Squadron Leader. On 20 December, less than two weeks after the wedding, Lambert took off from Kenley with 421 squadron under the command of Wing Commander Godefroy, when they were attacked by 18 Me. 109s and 20 FW 190s; a huge dogfight ensued. Lambert managed to take down one of the Me. 109s, but towards the end of the dogfight was heard by one of his fellow pilots asking for a homing over the radio; this was the last heard of Lambert of his Spitfire. He was 26 years old. S/L James Lambert was laid to rest in Cambrai (Route de Solesmes) Communal Cemetery, Nord, France. Plot 1, Row B, Grave 15.